iCloudANE is a native extension that enables the use of iCloud storage service. The extension supports String Key-Value Stores, that can be combined with JSON to store complex data. The iCloud service allows iOS application to share information among different devices. 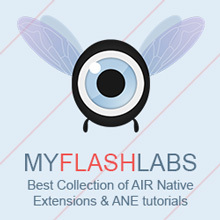 Air Native Extension, iOS Commercial. URL. Could this extension be applicated on Android device… To have a right connection on iCloud ? Please ! As far as I know, it is built on top of the iOS API, so it should not work on Android. I advise you to check that more carefully with the authors. The extension does not allow you to save images directly. You can only store text-based information, so if you want to store an image, you can serialize it somehow (e.g. using a ByteArray) and store the result. It’s not the best way to do it, but it can be done.